Patrick Merrell is a professional puzzlemaker, cartoonist, writer, illustrator, and graphic designer. He's one of MAD magazine’s “Usual Gang of Idiots.” He's created over 250 books, including 75 puzzle books, and written 81 crosswords for The New York Times (including 19 Sundays). Six of his Times crosswords appear in Will Shortz Picks His Favorite Puzzles, the most of any constructor. From 2009 to 2011 he wrote for Wordplay, the daily online crossword column for The New York Times. Over the past 25 years, he's produced thousands of illustrations, cartoons, greeting cards, posters, book covers, logo designs, and articles for a myriad of publishers, advertising agencies, national magazines, books, design firms, city agencies, and … well, you get the idea. 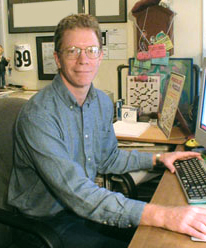 In addition to writing crosswords for The New York Times, he's also created puzzles for the Los Angeles Times, Wall Street Journal, Scientific American, People, Sports Illustrated, MAD, National Wildlife Foundation, Crayola, Scholastic, the American Crossword Puzzle Tournament, the World Puzzle Championship, and many, many others. Two of his crosswords and an interview were included in the 2006 documentary Wordplay. He works quickly, is invariably pleasant to deal with and has never once been late with a job. In his spare time he’s a bicycle road racer and writes animated screenplays (not yet coming to a theater near you). He’s married, with one beautiful daughter.